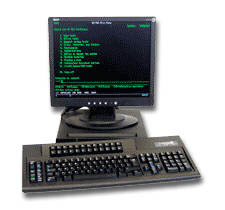 Twin Data provides Twinax Terminals from the three major manufacturers of them - CLI (Computer Lab International), I-O Corporation, and IBM. Click on the image of each terminal to be taken to the web page for each model for more information. From top to bottom the 3 images are a CLI 5476, an I-O 2677m and an IBM 3488 / IBM 3489. With some of the older terminals you have installed you probably are looking at a faded screen that's difficult to read. That's simply because they have been in use for so many years. By upgrading to Modular Twinax Terminals you see here from CLI, I-O Corporation and IBM you will be getting a much newer unit with a larger screen that's easy to use. And, it is as simple as "un-plug and re-plug" to replace your faded or non-working Twinax Terminals. We can even set the Device Address of the Terminal so it's ready to go when it arrives. The keyboards are the same 122-key (24 command keys) or 102-key (12 command keys) layout you are currently using. These units are the plug replacements for what you are using now. For whatever you need, our goal is to provide you with the best possible products available to satisfy that need. Below is pricing for CLI (Computer Lab International), I-O Corporation and IBM Modular Twinax Terminal models. If you have an IBM 3476, 3477, 3486 or 3487 that needs replacement, your current keyboard may be just fine. All you will need to replace is the Logic Unit itself. Add a 17 inch LED monitor to it and you have your new, System Console. 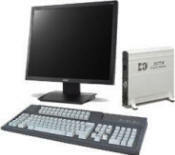 With the USB Twinax Emulation Kit (as shown with the laptop PC at the left) you can turn any desktop PC or Laptop PC into a full function Twinax System Console or Twinax Terminal. You can even access it remotely using Windows Remote Desktop or other programs such as GoToMyPC or LogMeIn. If you are replacing a "like brand with like brand" terminal, in most cases you may need to only replace the "brains" of the terminal - the Logic Unit itself and an LCD Monitor. You may also be able to use the current keyboard. 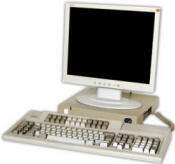 For example, if you are replacing and IBM InfoWindow Model 3477 with an IBM InfoWindow II Model 3488, you can continue to use your current keyboard.